Comparable printed and painted tile, decorated with W.S. Coleman's 'Naturalistic' motifs, Minton & Co., c.1870. © Victoria and Albert Museum, London. Inv. C.245-1976. 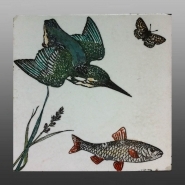 Earthenware tile with printed and painted 'pond life' design consisting of fish with beetles, a butterfly and snail within a hatched border. The colours are yellow, pale green and pale purple, with the printed image in dark brown. The tile has a raised grid surface and the maker's company name on the reverse. The design is similar in style to those by the artist William Stephen Coleman for the Minton Factory. Coleman started designing for the company from 1866 later becoming Artistic Director of the Minton Art Pottery Studio in Kensington Gore. His designs were influenced by the pared back and stylised compositions of Asian, in particular Japanese, illustrations, popular during the Aesthetic period. As Minton Hollins & Co. definitively separated from Minton & Co. in 1868, it is likely this design was inspired, rather than designed, by Coleman's work.